A Fifty Something with a science/engineering background. Hates junk science and scaremongering self-appointed experts. Seeks error in everything. A staunch defender of the 'Scientific Method'. 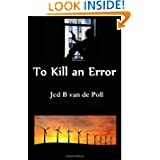 Author of 'To Kill an Error' a novel approach to Global Warming Scepticism.